Like a playlist made by that friend who is always on the look out for the latest discoveries: this is how the new edition of Primavera Club will be like. Some of the most innovative musical proposals of the moment will be heard from Friday 20th to Sunday 22nd October in Barcelona and Madrid, cities which will once again be the privileged setting for a line up carefully chosen by the Primavera Sound team. Primavera Club is the festival where headliners are made live, on stage and in front of the most open-minded audience. There will be a total of 39 artists together in a diverse and exhaustive programme that holds all the tricks. One of the winning hands is held by Amber Coffman, ex vocalist of Dirty Projectors who will present her solo debut, but as always there will be room for all types of proposals: from the electronic jazz-influenced music by Clap! Clap!, to the latest garage band signed to the label Rough Trade Starcrawler and passing by Superorganism, the mysterious sensation of the year fronted by a 17-year-old Japanese girl that has impressed Frank Ocean himself. 2017 is the year that the festival goes back to Madrid: the venues Joy Eslava, Teatro Barceló, El Cielo de Barceló and Taboó will host the majority of the artists of this edition, which will return to Madrid after an absence of five years. In Barcelona the nerve centre will continue to be Apolo together with the completely remodelled La  de Apolo, besides the Centre Cultural Albareda that will once again host the daytime concerts during the weekend. This expansion of Primavera Club has been facilitated by SEAT as a strategic partner, thus strengthening the collaboration that began this year between the automobile manufacturer and Primavera Sound. 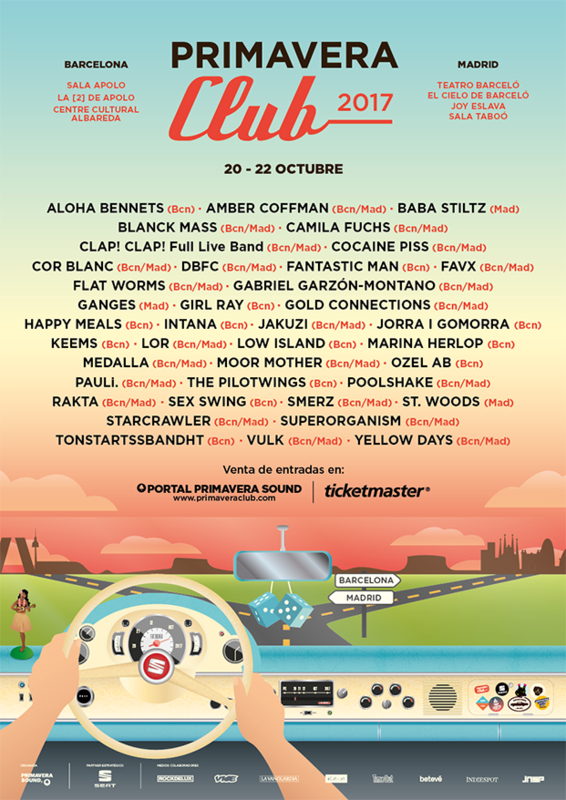 In an autumn full of concerts by big names, Primavera Club emerges as a daring alternative in its well-established vocation of backing international artists who have not yet played in our country, offering a line up remarkable for lowering the usual average age on the stages. In this context the new r&b focus will be on the British newcomer PAULi. and on the New York artist Gabriel Garzón-Montano, while guitars will still be well represented by the Angeleno punk supergroup Flat Worms (with members of Thee Oh Sees, Ty Segall and The Babies) and by the effervescent indie rock by Gold Connections. Also, Yellow Days and the Norwegians Smerz will have the chance to prove why they are small viral phenomena, the Turkish band Jakuzi will play their elegant synth pop which promises to get people talking, and Low Island will test out an exquisite proposal which aspires to fill big stages. As usual, proposals from the home base will be well-represented by names with a brilliant future such as Intana and Cor Blanc, the very intimate voice and piano sound of Marina Herlop (signed to James Rhodes' label), explosive post-punk by Vulk and the frantic Medalla, risen from the ashes of The Saurs, among many other dynamic offerings that will excite the audience. With the aim to bring these proposals to a new audience, the Primavera Club full festival tickets are on sale at the price of 25€ both in Barcelona and Madrid. These full tickets give access to all the concerts in each city. There will also be day tickets available for each of the three days (20th, 21st and 22nd October) at the price of 15€. As at the 2016 edition, the concerts in the Barcelona Centre Cultural Albareda will be free and open to the general public until full capacity is reached.